I'm so glad that scientists in Russia are working feverishly to make it possible for the world's billionaires to live forever in shiny new cybernetic bodies. ("Human Immortality Could be Possible by 2045, Russian scientists say," CBC Community blog, July 31, 2012). After all, pillaging, plundering and accumulating billions in the span of a normal lifetime is just so 2011… been there, done that. With all the time in the world to effect their machinations on the rest of us, humanity can soon look forward to the first trillionaires and then… what comes after trillionaire? And, with cyborg bodies impervious to pain, hunger, temperature or anything else, at least somebody will survive and thrive in the extreme climate change that all those egghead scientists keep nagging us about. Who, I ask you, is more deserving of immortality than the 1% of the 1%? It wasn't that long ago that questing for immortality was seen as arrogant and unseemly and something that was better left to God or Providence or whatever. Traditionally, would-be immortal beings have not fared well in popular culture -- whether it be a stake through the heart, a silver bullet or the sun's cleansing rays, nature and the great Circle of Life (including that vital component, Death), always won out. In spite of the title, The Thing That Couldn't Die is no exception. As it turns out, the Thing can indeed die (I don't think I'm giving away too much here), but it does its darnedest to creep out the audience before it meets its inevitable fate. 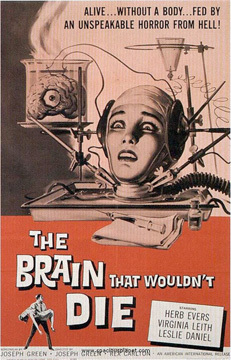 Although The Thing is obscure even for '50s B sci-fi-horror-thrillers, I distinctly remember watching it on the old black and white TV in the basement rec room and being more "weirded out" than usual-- I was only 9 or 10, and needless to say I didn't sleep well that night. Years later, I hunted down a VHS copy to figure out why the thing had such an effect on me back then. meet an undying, Devil-worshiping Thing. 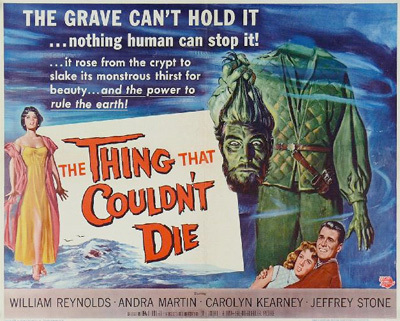 The Thing That Couldn't Die is a compact, unpretentious horror-thriller, with the action taking place at a single location mostly at night, and featuring a monster that manages to scare with a minimum of make-up and special effects. The setting is a ranch in some unnamed location in the southwest. Struggling artist Hank Huston (Jeffrey Stone) and his fiancee Linda (Andra Martin) are visiting for the fresh air and artistic inspiration, along with Gordon Hawthorne (William Reynolds), a local boy back from college for the summer. The movie opens with the three watching ranch owner Flavia McIntyre (Peggy Converse) and her teenage ward Jessica Burns (Carolyn Kearney) looking for water the old-fashioned way-- with a dowsing rod. Jessica is emotionally and psychically sensitive, with a good track record for finding lost objects and groundwater using her special gift. The ranch guests are skeptical, until Jessica tells Linda where she can find her lost watch-- in a mouse's cubbyhole at the base of an old tree. They also find an old medallion that college-boy Gordon gives to Jessica for protection against evil. "Nature seems to speak to you in voices the rest of us can't hear," he tells the moody teenager. It comes in handy, for before long, Jessica uses her special gift to locate an intriguing old chest. A date, 1579, and an ominous warning are inscribed on it: "If you value your eternal soul, open not this accursed chest." Believing it to be a treasure chest left behind by Sir Francis Drake's expedition, Flavia wants to open it right away, but the level-headed Gordon convinces her to wait until an expert from the university can examine it. Of course, greed wins out, and the ranch foreman assigned to guard the chest (James Anderson) convinces the hulking, simple-minded ranch hand Mike (Charles Horvath) to help him open it. Instead of treasure, they find the severed, but still living head of Gideon Drew, who, as we find out later, was a Devil-worshipping member of Drake's crew. Drew's head immediately casts a spell over the brutish Mike, who promptly kills the crooked ranch foreman. Using Mike as "transport," Drew proceeds to search for his body while casting an evil pall over the ranch and its residents. This hat was designed by Edith Head. Thing delivers some good, creepy moments. 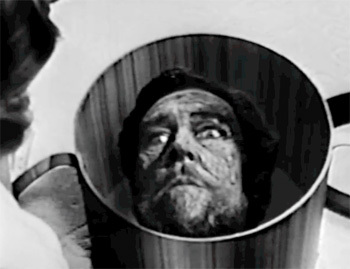 Particularly effective is the opening of the chest in the dead of night to reveal the severed head of the old Devil worshiper-- both repellent and rakishly handsome at the same time, Gideon's hypnotic eyes fix on the simple ranch hand while his lips mouth a silent spell. Later, with the hypnotized Mike's able-bodied help, Drew goes in search of his body. There's a classic "face at the window" scene, with Mike holding up the eerie head so it can peer into Linda's bedroom. The scene that really got my 10-year-old heart racing comes at the end, in the very ordinary setting of the ranch house living room. As the protagonists look on in horror, a hand emerges from the box with Drew's headless body, pushes the lid open, and the whole headless corpse shakily stands up while the head waits breathlessly (pun intended) to be reunited with it. Given the obvious budget limitations, the filmmakers wisely emphasized atmosphere over fancy effects. The nighttime photography is particularly effective for such a low-budget production. And while the monster is recognizably human, the concept of a living, demonic head enlisting impressionable humans to help him look for his body is enough to make the skin crawl. The problem with the film is that it wraps things up just as the monster really comes "alive" and begins to flex its supernatural powers. As head and body reunite, Gideon exalts: "At last I breathe again! Satan still lives -- four centuries have not reduced his power!" And then, a few moments later, he's proved wrong as wrong can be in about the most mundane way imaginable. Over. Finis. Thaaaaaaaaat's all folks!! A clue to Thing's abrupt, unsatisfying ending perhaps lies in director Will Cowan's resume. 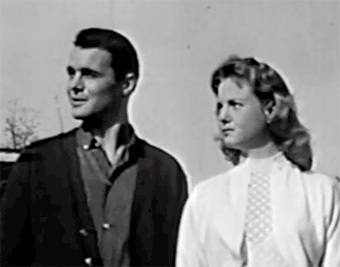 With only one other exception, all the films Cowan directed in the '40s and '50s were shorts. It's as if he just wasn't up to directing something with a larger budget and longer running time, and his instinct, honed over two decades of making shorts, was to wrap things up quickly. Still, he does deliver some pretty eerie sequences and decent shocks in the build-up to the disappointing climax. Baby Boomers might recognize lead actor William Reynolds (Gordon). After a string of B movie roles in the '50s, Reynolds stepped into television, appearing in such series as Wagon Train, Maverick, and The Twilight Zone, before landing his most notable role as Special Agent Tom Colby on Quinn Martin's The F.B.I. A good copy of The Thing That Couldn't Die is hard to find, but MSTK3's version is available on YouTube. A wealthy businessman with a brain tumor enlists the aid of a dedicated but ethics-challenged scientist to resuscitate the head of Nostradamus, whom he plans to groom to take over his business empire. Definitely in the running for the wackiest B sci-fi movie concept ever. Starring the ubiquitous Robert Hutton as the pedantic scientist. This German production features the gloriously evil and demented Dr. Ood (Horst Frank), who "saves" his mentor after a heart attack by keeping the severed head alive in a serum first tested on dogs. He then plans to use the senior doctor's knowledge to transplant the head of his hunchbacked girlfriend onto the body of an exotic dancer. A dark, cheesy and very guilty pleasure. This one has achieved mythic cult status with its sleazy themes (liberally borrowed from The Head) and outrageous overacting. How can you go wrong with a beautiful, telepathic living head, voluptuous strippers, and a monster in the basement all wrapped up in one nice, neat B movie package? Stars the weary-looking Jason Evers, who was slumming in between stints on such TV shows as Laramie, The Defenders, Gunsmoke, and The Guns of Will Sonnett.